The proposed Orbit training centre in Cabo Verde. Cape Verde would seem to be an unlikely location for an international military training center. The 10 islands comprising the nation are 570 kilometers west of the African continent in the North Atlantic Ocean. With a total area of just more than 4,000 square kilometers, Cape Verde is one of the smallest members of the African Union. But for a variety of reasons, it is seen as the ideal spot for a $125 million training center dedicated to African security forces. The center, scheduled to open in 2020, is a public-private partnership. The Orbit Training Center will be able to house 150 students and instructors. With more than 250 hectares of space, it will be open to police, armed forces, customs agents, wildlife rangers, intelligence analysts, military medical specialists, survival instructors, civil protection forces, cyber crime investigators, military telecommunications personnel and information-technology specialists. Although training personnel from African nations is the primary goal, the center also plans to offer services to other countries. The facility will combine a standard military training center with simulation technologies. 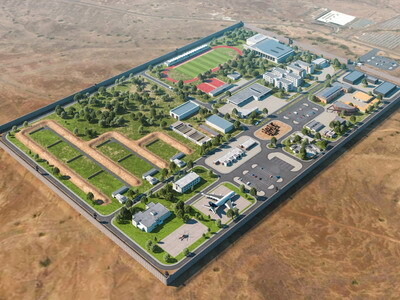 It will have modules dedicated to indoor and outdoor shooting; combat shooting; sea, air and land teams training; intelligence analytics; military and secured communications; legal and tactical interception; crowd control; drug enforcement; poaching; and cyber crime. Orbit officials describe Cape Verde as an “easily accessible location” in an “an ideal host country” that has good governance; an open, transparent administration; and a stable democracy. It has six international airports and is almost equidistant from Brazil, Europe and the United States. The center will bring a new source of revenue to the country and create jobs. Two private companies are backing the center: Competences and Nibor Enterprises. Competences is a Cape Verdean private company established in 2004, that specializes in providing homeland security and defense solutions. Company officials say it has been involved in “major national security projects” for African governments. Nibor Enterprises, founded in 2009, is a U.S. and Israeli engineering and general contractor company that specializes in construction management and design. Company officials say that Nibor has carried out 20 contracts for the U.S. Department of Defense worth a total of $55 million. Orbit said that Cape Verde’s customs officers, police and Army will have priority access to the center, with the country seeing substantial savings on its military training budget. Revenue will be raised through facility rentals to clients, with some income also coming from international aid to Africa’s defense and security forces. Orbit joins a growing group of institutions, public and private, that are helping train Africa’s peacekeepers. But the training they offer is not limited to Soldiers, and the courses are not limited to peacekeeping. The center has conducted more than 400 courses, with students from more than 90 countries. It also has hosted organizations from Africa, Asia, the Americas and Europe. It has been designated one of three ECOWAS Training Centres of Excellence, along with Nigeria’s Defence College and the School of Peacekeeping Alioune Blondin Beye in Mali. It has established partnerships with an array of international institutions, including the United Nations, the German Agency for International Cooperation, the Dag Hammarskjold Foundation in Sweden, the University of Queensland in Australia, the United States Military Academy at West Point, the University of Bedfordshire in the United Kingdom, the Ghana Armed Forces and the Geneva Centre for the Democratic Control of Armed Forces. The center conducts operational-level training for peace support personnel. This training is based on a military task force or brigade structure, and the trainees are military, civilian and police officers. Center officials say the majority of participants are civilians. “All courses complement each other and serve the broader interest of ECOWAS and its peace support operations, although a strict separation into tactical, operational and strategic may at times be superficial,” the KAIPTC said on its website. The work of KAIPTC is complemented by other centers involved in training and developing skills in the theoretical and practical aspects of peace operations. In recent years, the center has placed more emphasis on training peacekeepers in human rights and gender equality. At the end of the 1980s, the international community was involved in numerous peace support operations around the world, with African nations contributing large numbers of ground troops. A turning point came in 1990 when the Economic Community of West African States Monitoring Group was formed to intervene in the civil war in Liberia. The mission showed a need for more peacekeeping training for African security professionals, and in 1999, France and Côte d’Ivoire created the Zambakro Peacekeeping School in Côte d’Ivoire. The school trained 600 officers from 40 African countries in three years. Côte d’Ivoire’s civil war of 2002 forced the transfer of the school to Mali, with France’s continued support. The first Mali site was 60 kilometers northeast of the capital of Bamako, but eventually proved to be too small and too remotely located. The school moved to Bamako and opened its new School of Peacekeeping Alioune Blondin Beye (EMPABB) facility in 2007. Argentina, Canada, Denmark, France, Germany, Japan, the Netherlands, Switzerland, the United Kingdom and the United States shared the building costs. From the outset, it was intended as a complementary facility to the KAIPTC in Ghana and provides tactical-level training for peacekeeping operations. The school focuses on the elements required for carrying out the standing tasks and activities of a peacekeeping operation. It is predominantly a military structure at the battalion and company levels, with both police and civilian components. EMPABB describes itself as a center for strengthening African capabilities to manage peace operations, as well as spreading the “culture of peace.” The center has partnered with nongovernmental and international organizations in the way planned for the Cape Verde center. The EMPABB has trained more than 8,000 people. Each year, it handles an estimated 1,000 civilian, police and military trainees, either directly at the center or outside the country, using traveling teams of instructors. With its partnerships and international support, the center has equipment and an infrastructure that are unique in Mali. The partnerships include some nongovernmental organizations. The school’s board of directors includes representatives from ECOWAS, France, Germany, Japan, the Netherlands and Switzerland. A typical offering is the school’s three-week course in training for possible deployment as a U.N. military observer. One such class brought together 25 military officers from 10 countries. In the first week, the class learned the legal framework for missions and partners in peace support operations. The class also studied disarmament, demobilization and reintegration; civil-military acts; and fundamental tasks of an observer. In the second week, the instructors discussed mine awareness, character analysis, working with the media, risks and threats, and protective measures. The students learned mediation, investigation and liaison techniques. Class members spent the final week conducting practical exercises based on what they had learned. The Peace Operations Training Institute of the United States has partnered with EMPABB to provide free online peacekeeping courses. They are offering 29 courses in English, 24 courses in French, 17 courses in Spanish, and others in Arabic, Chinese, Portuguese and Russian. Nigeria’s National Defence College and the International Peace Support Training Center in Kenya also are offering the free online courses. The college was established in 1992 as the highest institution for the training of senior military officers in Nigeria. The Nigerian Armed Forces had long established a strong military training heritage with the establishment of the Nigerian Defence Academy in Kaduna for cadet training and the Armed Forces Command and Staff College in Jaji for middle-level staff training. Nigeria decided it was appropriate and cost-effective to establish a third institution for its most sophisticated training. The college started at temporary quarters in Lagos, moving three years later to another temporary site in Abuja. The current, permanent site also is in Abuja. The college has developed a working relationship with its counterparts in Turkey, and in February 2018, it hosted a delegation from the Foreign Relations Department of the Turkish General Staff. Two months later, Nigeria signed a military training agreement with Turkey covering anti-piracy, humanitarian aid, peacekeeping support and other areas. The agreement covers training cooperation, exchanges, exercise observation, joint exercises, military history, logistics, maritime security, personnel exchange, mapping and hydrography, special forces, and special expertise courses, such as explosive ordnance disposal, defenceWeb reported. The Nigerian Institute of Management has partnered with the college to eliminate military corruption. The institute and the college want to make Soldiers not only honor their military code, but be bound by the institute’s code of conduct. The International Peace Support Training Centre (IPSTC) in Kenya began as the Peace Support Training Centre, part of the Kenyan Defence Staff College. Its primary mission was training Kenyan forces for U.N. peacekeeping missions and African Union peace operations. It became a separate entity in 2006 and merged with the International Mine Action Training Centre in 2009, adopting its current name. In 2011, through formal partnerships with Canada, Germany, Japan, Kenya, the United Kingdom, the U.N. and the U.S., it became an autonomous institution. The center’s core mission is to train Soldiers, police and civilians in peace support operations and how to respond to complex emergencies. The center also is a research facility, studying a range of topics including conflict prevention, field and staff management, and post-conflict reconstruction. In recent years, the center has increasingly emphasized the impact of armed conflicts on women and children. One of the hallmarks of the school is its Senior Mission Leaders Course, conducted twice a year. Typically, military, government and police officials from about a dozen countries take the two-week course, which trains participants to plan, manage and conduct deployed support for U.N. and African Union peace missions. In 2015, the IPSTC established a gender equality policy, both for the center and to advance women in peacekeeping missions. The policy promotes the application of the U.N. Security Council resolutions on women, peace and security. Specifics include monitoring the ratio of male to female students at the center to achieve gender balance, including a gender component in most of its training courses, and making gender issues a key component in the planning and implementation of all peacekeeping missions. The Southern African Development Community (SADC) established the Regional Peacekeeping Training Centre in Zimbabwe in 1996 to provide training for peace support missions in the region. The center was built in Harare in 1999 with money from the government of Denmark. Although the center was built specifically to offer peacekeeping training to SADC countries, it has expanded its reach to include other countries in Africa. The center has participated in the preparation and running of all major peacekeeping exercises conducted in the region, including Blue Hungwe in Zimbabwe in 1997, Blue Crane in South Africa in 1999, Tanzanite in Tanzania in 2002, Exercise Thokgamo in 2005 in Botswana and Ex-Golfinho in South Africa in 2009. In 2017, after the establishment of the center’s newest five-year plan, it hosted its first Civilian Foundation Course for peacekeeping missions. The course targets civilians who have no peace mission experience, as well as personnel who have some experience, but no formal peacekeeping training. The United Nations says there are 124 peacekeeping training centers throughout the world, with some more active and comprehensive than others. Africa’s training centers are among the youngest on the planet. But whether they are government-run or public-private partnerships, many of them already have established world-class programs.